Selection sanitary samples is an important part hygiene studies (see). Sanitary air samples for chemical analysis and the determination of the total dust taken in the area of human breathing at a height of 1.5 m from the surface. In the study of atmospheric air pollution by industrial emissions necessary to determine the average and maximum single concentration of harmful substances. Sanitary air samples taken at the peak of its pollution, downwind from the source of pollution (at least 10 samples at each point in equal intervals of time). The duration of the sampling 15-20 minutes With increasing distance from the source of pollution (3 - 5 km) the length of the sample is increased to 30-40 minutes To determine radioactive and carcinogenic substances have to passivate through appropriate filters large volumes of air, as these substances are contained in the atmosphere of populated areas in very small quantities. When sampling of air in industrial enterprises to study the content of dust and toxic substances (gases, vapours) are important sampling points. In production areas, given the high mobility of the air environment and the uneven distribution of polluting substances, devices for air samples should be placed as close to the permanent place of stay of the worker during the work: at the level of 1.5 m from the floor level breath work). During the shift produce three trials: in the beginning, the middle and the end of the shift. When sampling of air is necessary to measure its temperature and relative humidity. Adsorption devices used for sampling, are glass vials sealed top and welded with two glass tubes: long, through which comes from the premise investigated the air, and short attached through the rheometer to the blower. In the bottom portion of the absorber is filled with absorbing liquid through whom promazyvaya analyzed air (sinks Polezhaev, Fig. 1). When sampling air suction method you need to follow the speed prisasyvaniya investigated air through the absorber. For most gases and vapors this speed is 15-30 l/hour. In Fig. 2 shows the scheme of connection of devices when sampling electroepilation. Fig. 2. 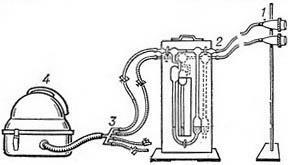 The scheme of connection of devices when sampling a vacuum cleaner (electroaparatura): 1 - cartridges with filter; 2 - rheometer; 3 - branched transition; 4 - cleaner. In bottles and gas pipettes investigated the air select the vacuum way. Previously one of them the vacuum pump pump out air to a residual pressure of 20-50 mm RT. century At the place of sampling open the glass crane, and studied the air fills an empty vessel.